Do you have an amazing view that you want to take advantage of? If you've purchased your lot and you want mountain house plans with a front view or lake views to the front of your property, a front view kitchen home plan from Donald Gardner Architects will make sure you enjoy the view from as many rooms and angles as possible. Front view kitchen house plans often start with a large front porch. Get outside with comfortable chairs, or better yet, a front porch swing to enjoy uninterrupted views from your front porch. The inside layout of your home plan will also be designed to take advantage of front views. A kitchen with a front facing window will allow you to look out while cooking. The Ferris home plan 1405 is designed to take advantage of front views. The spacious island kitchen features a large window with front views and large island for entertaining while cooking. In addition, a deep front porch allows plenty of space to enjoy front views. 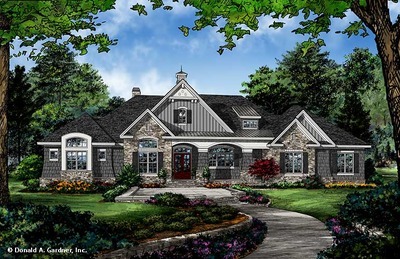 The Coleraine house plan 1335 is a modern farmhouse with an expansive, columned front porch. This wide front porch offers plenty of space to sit outside and enjoy front views and large windows in the kitchen bring the front views in. If you are looking to showcase front views, our home plan portfolio is sure to meet your needs. From simple home plans to luxury designs, Donald Gardner Architects offers a variety of dream house plans to meet your needs. If you've already found your dream home plan and want to add front views, submit a modification request to our qualified designers.